We flew from Houston Intercontinental Airport to Puerto Vallarta, Mexico. On the same flight were Elizabeth's folks, Richard and Marjean Tappenden. 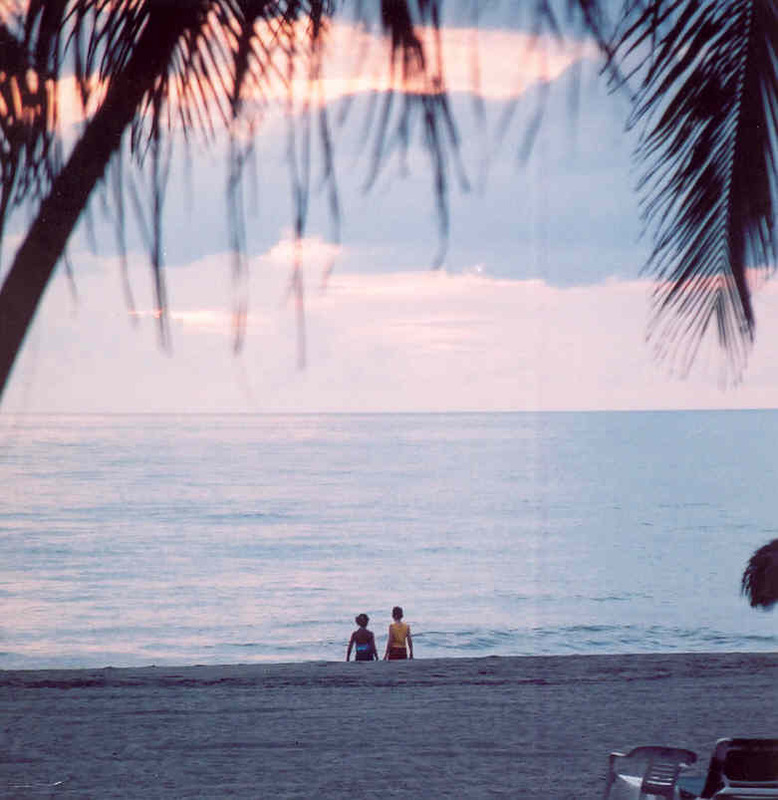 Upon our arrival in at the Puerto Vallarta airport, we were pestered by a variety of timeshare sales people who were marketing timeshares at the Paradise Village Resort and other resorts. Since we were scheduled to stay at the Mayan Palace Resort, we arranged taxi service to our planned resort, at which we strayed a couple of days, although we changed to the Paradise Village Resort later in the week (on Tuesday). Although the accommodations were quite nice at the Mayan Palace Resort, We were a bit annoyed that we were so far away from routine shopping, restaurants, etc. 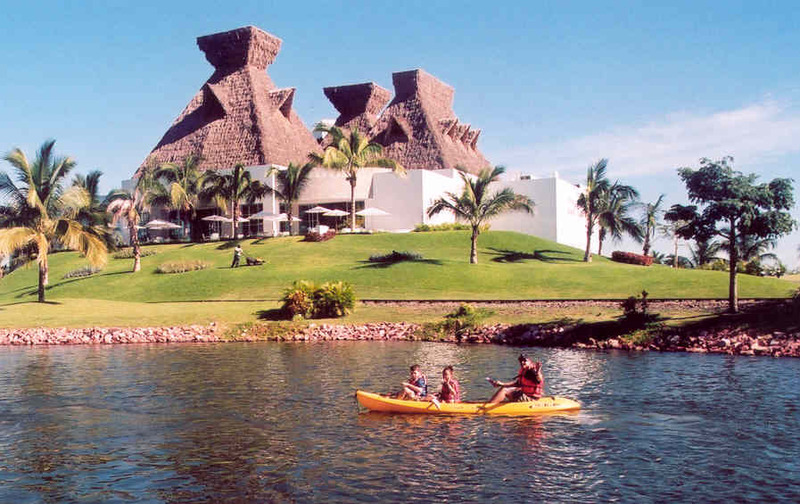 While at the Mayan Palace, we all did enjoy the swimming pool and I did take the kids on a canoe ride in the resort lagoons. However, after we changed to the Paradise Village Resort on Tuesday, we found that routine shopping was only one block away from the front gate. 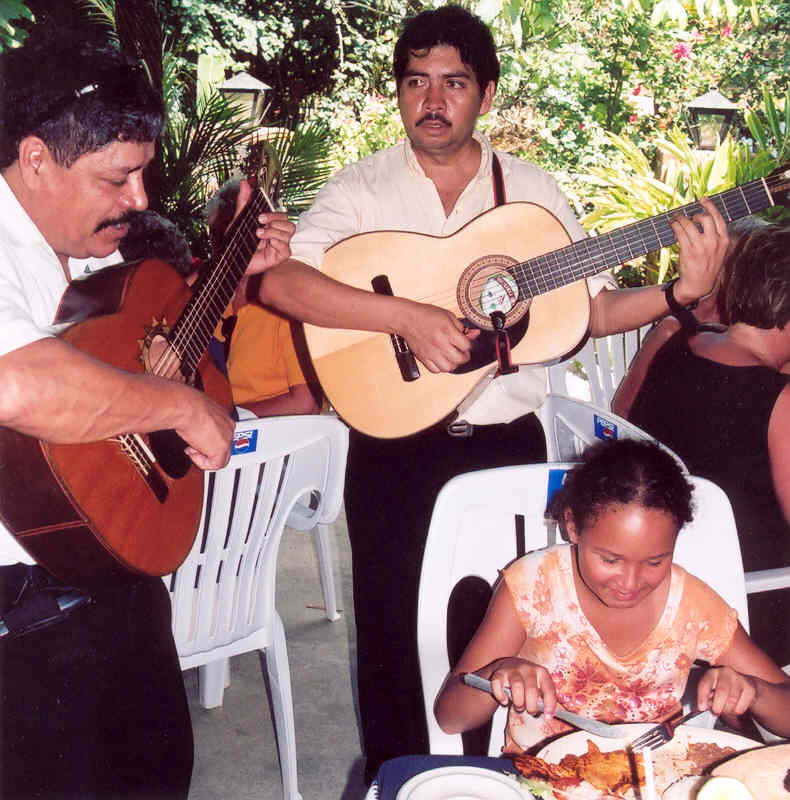 The Paradise Village Resort also had several restaurants on site, and had around-the-clock taxi service to other activities in downtown Puerto Vallarta. The Paradise Village resort also had many onsite activities around the pool including volleyball and water polo. They also had an onsite computer room in which resort customers could check email and surf the web. However, I was far too busy to ever get around to checking email while on vacation. 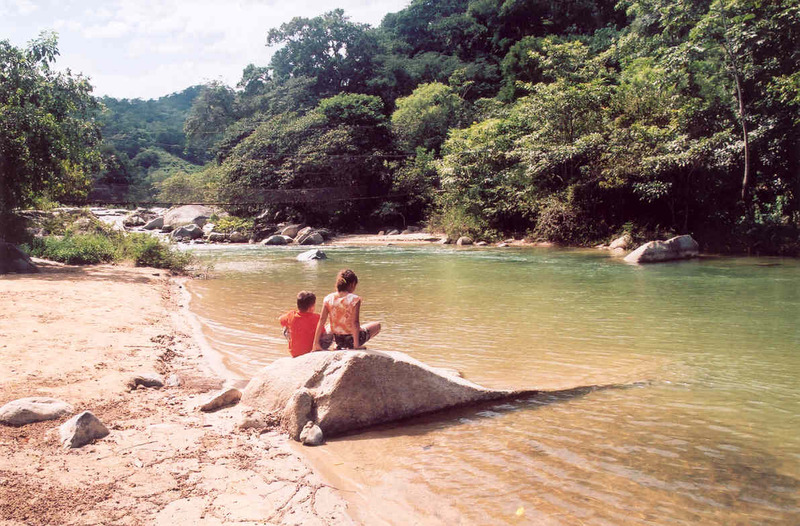 While in Puerto Vallarta, we took a tour of the 'old' city, which also included a visit to a remote site in the jungle, where we ate lunch at Gringo Jerry's Restaurant in the middle of nowhere on the bank of a river. The tour guide offered that tourist's were welcome to swim in the river, but no towels or life guards were provided... we were welcome to skinny dip in the river if we wanted to .... so I did. It was quite refreshing on a hot afternoon in the jungle. Fortunately nobody took pictures of this event. Later, during our bus tour, we went through a factory where they distilled tequila from blue agave cactus plants. I was fascinated to learn that most of the world's tequila was manufactured in Puerto Vallarta, but then was shipped to other merchants, who added other chemicals and preservatives to the raw liquid and then repackaged the tequila under other brand names. 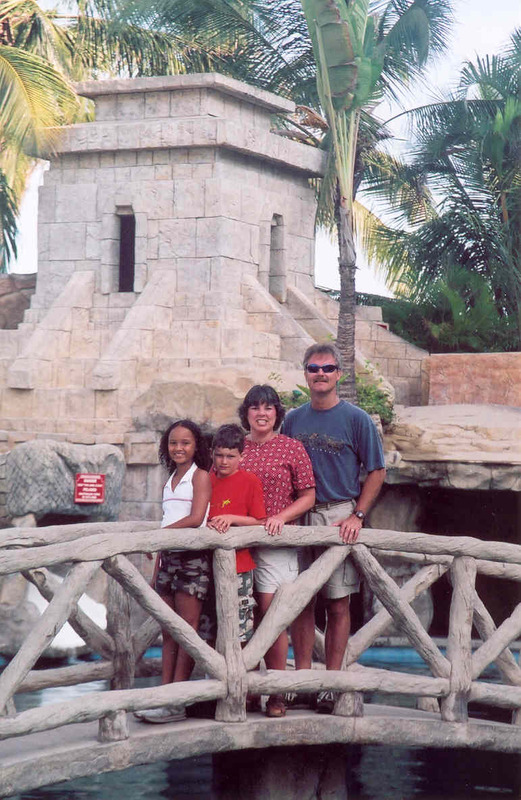 Elizabeth's folks and our family pose for a group photo at the Mayan Palace Resort. 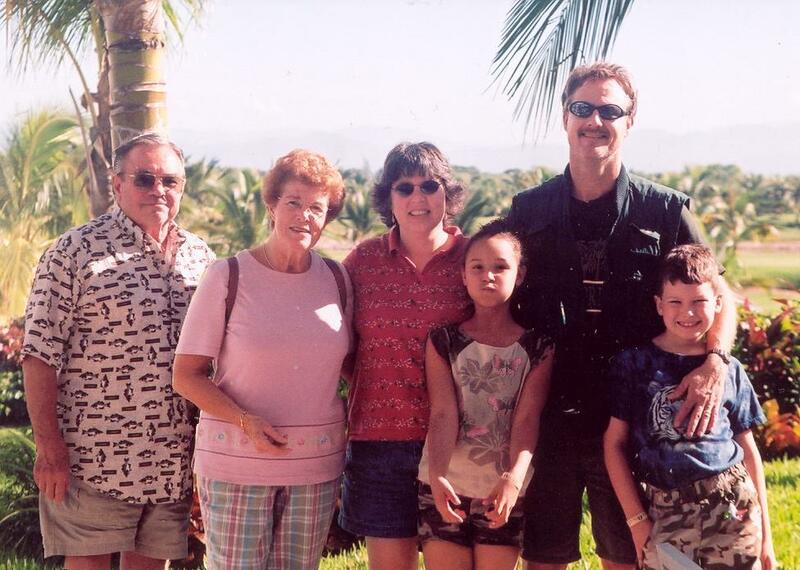 That is Richard and Marjean Tappenden on the left. Tom takes Katie Beth and Jeremy for a canoe ride on the lagoons around the Mayan Palace Resort. We got soaked by a few of the fountains in the lagoons. 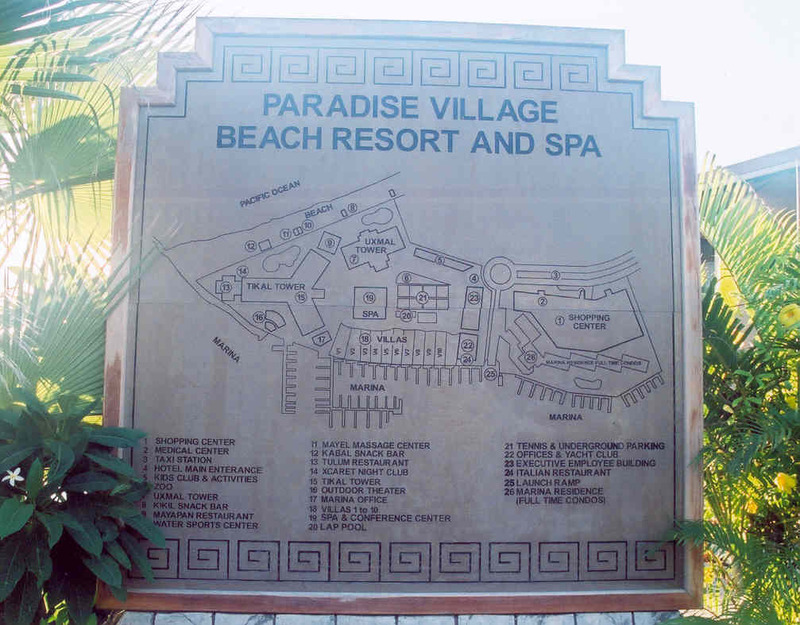 Map of the Paradise Village Resort. We relocated from the Mayan Palace Resort to the Paradise Village Resort on Tuesday of the week. 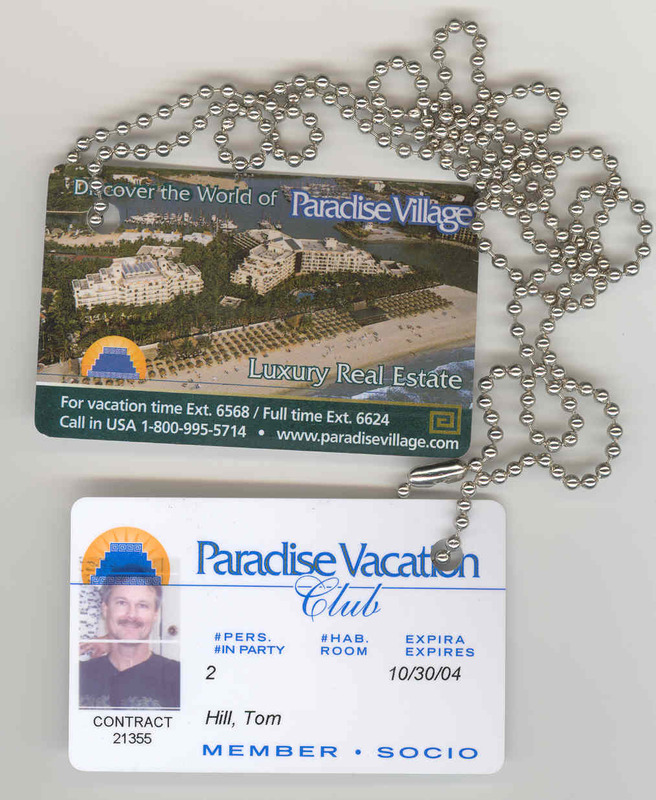 We found that the Paradise Village Resort had many more amenities including nearby shopping mall, several nice restaurants, and organized resort activities such as volleyball, water polo, and a golf chipping contest. View of the Paradise Village resort and beach from the chapel at the end of the sidewalk atop the breakwater lining one side of the harbor entrance. 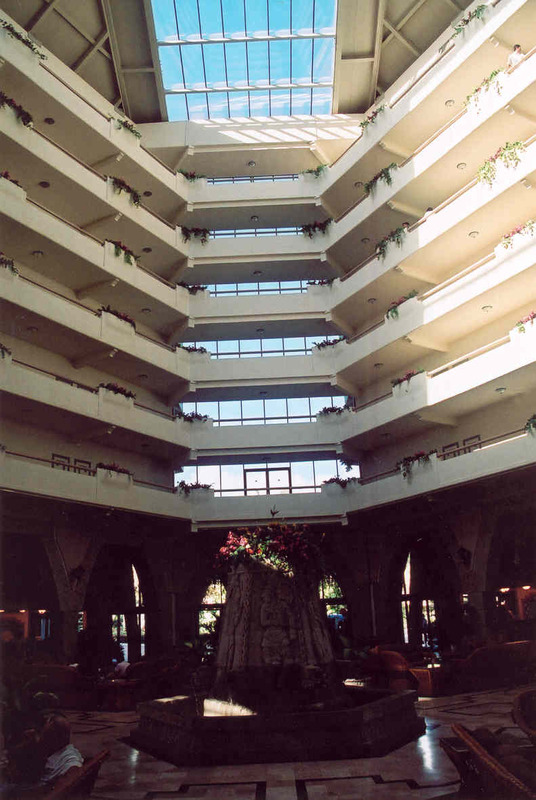 The lobby of the Tikal Tower goes up about 8 floors. We stayed on the third floor. Katie Beth, Jeremy, Elizabeth and Tom pose on the 'quiet' pool bridge for a photo. This pool was much quieter than the main pool having two slides and lots more people. 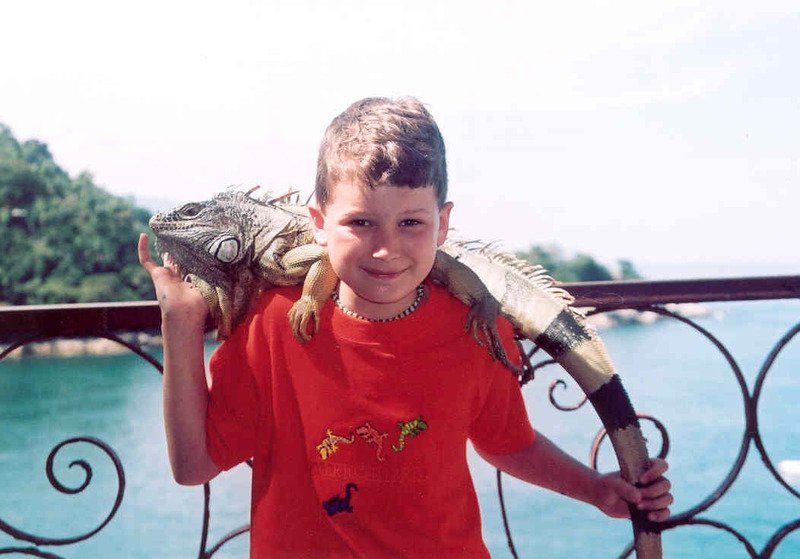 Jeremy gets up close and personal with an iguana who lives in the area near the hotel at which the movie 'Night of the Iguana' was filmed. The iguana seemed quite friendly as long as nobody told iguana jokes in Spanish. 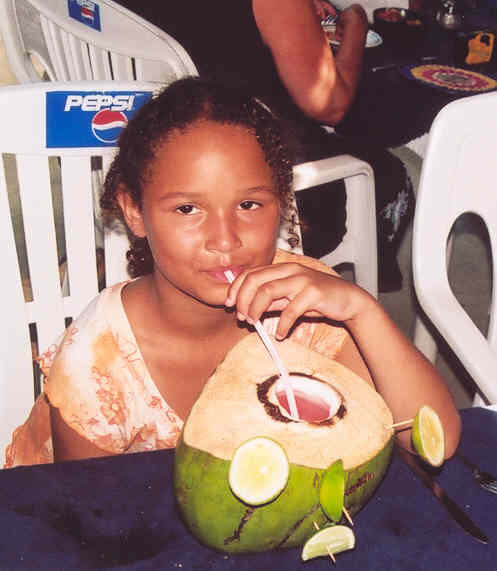 Katie Beth drinks a virgin cocoloco out of a coconut at Gringo Jerry's restaurant where we ate lunch during our jungle tour. The spiked version of this drink was alleged to cause grown men to make passes at ugly women. Guitar players sing Happy Birthday to Katie Beth at Gringo Jerry's Restaurant. Jeremy and Katie Beth goof off at the river. 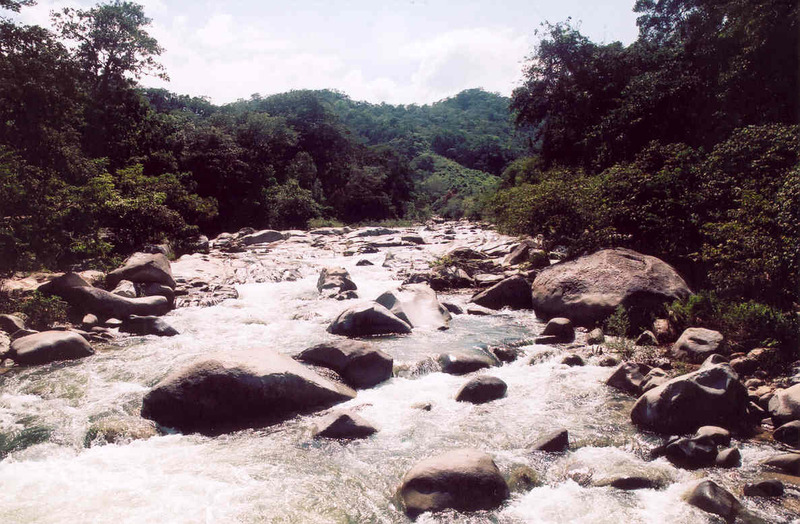 There is a foot bridge over the river in the jungle, which is suspended by steel cables. 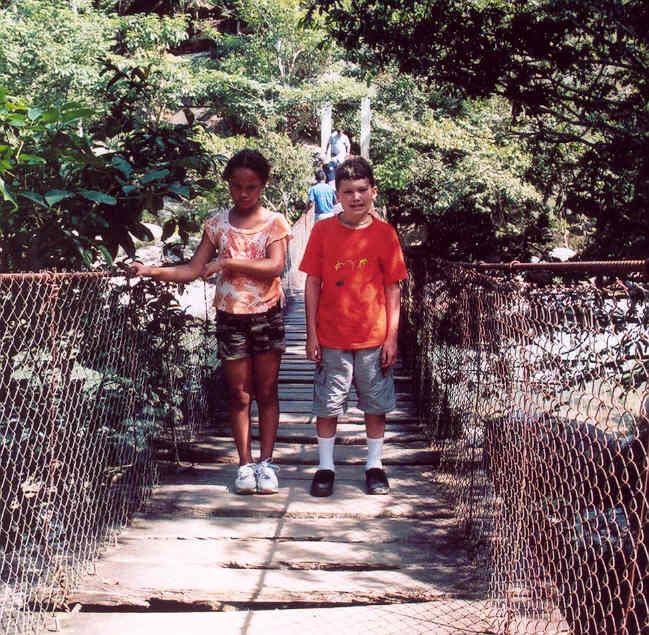 We saw several local children using that foot bridge to get home after school was out. This is the view of the river upstream of the suspension bridge. I walked about 200 yards up the river where I went swimming au natural on that hot afternoon. The water was cool and refreshing. 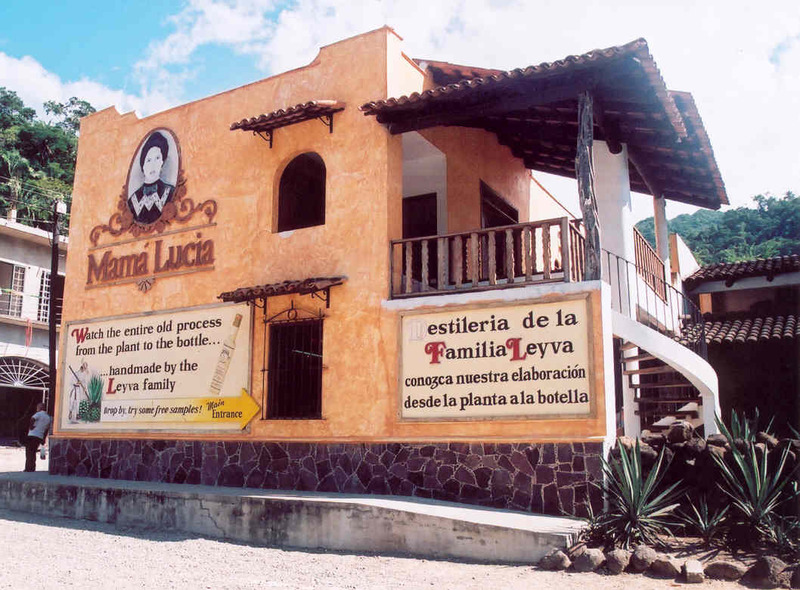 We took a tour of a Tequila Factory while on the tour of the old city area of Puerto Vallarta and jungle. They had free samples of tequila that was manufactured in flavors of coffee, orange, and natural. While on the tour, I learned that the best tequila is distilled from 100% blue agave cactus with no additives. Secondary manufacturers take the raw tequila stock and add a variety of chemicals to improve its shelf life and to add other flavors. The tour guide said it is the additives that contribute to the subsequent hangover one experiences from drinking too much tequila. 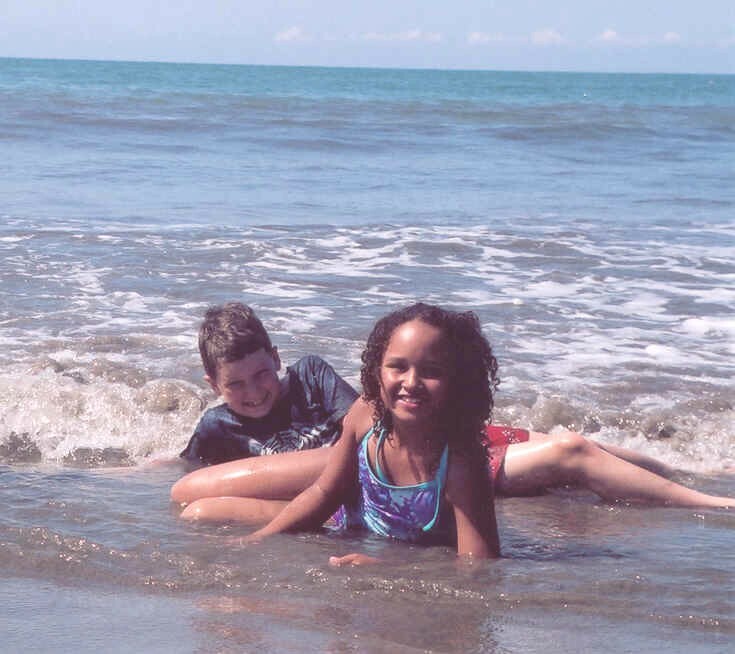 I took the kids swimming at the beach on several occasions. On three of those occasions I also happened to lose my sunglasses and resort room key in the ocean. I kept getting hit by big waves that knocked my glasses off my face, and turned my pockets inside out so as to wash away my room key cards. The resort security office reissued me a new keycard each time I lost one. After the third time, they also gave me a chain and punched holes in my keycards so that I could hang them around my neck. I was also able to purchase new sunglasses at the nearby mall. Jeremy and Katie Beth visit the beach. Jeremy and Katie Beth off in the distance. 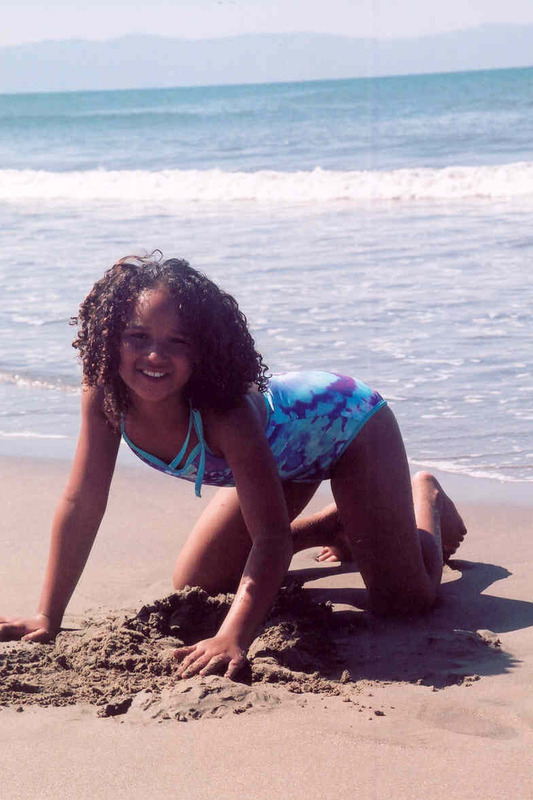 Katie Beth digging on the beach. 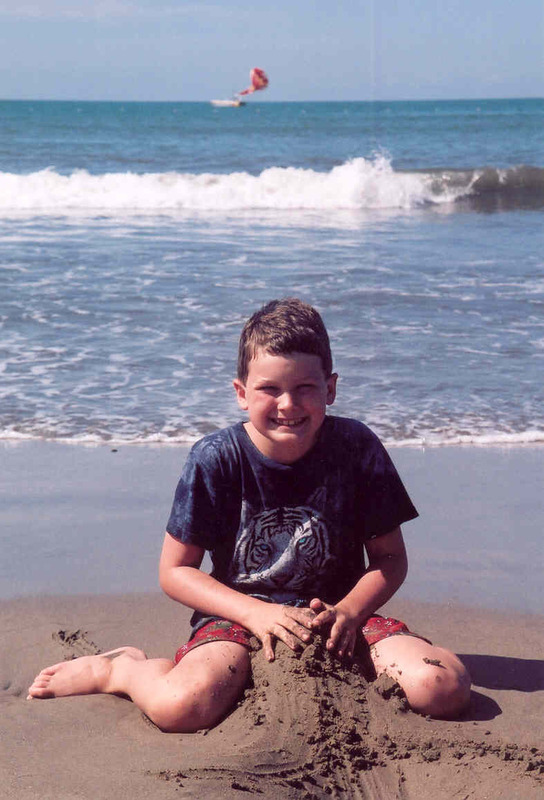 Jeremy digging on the beach. 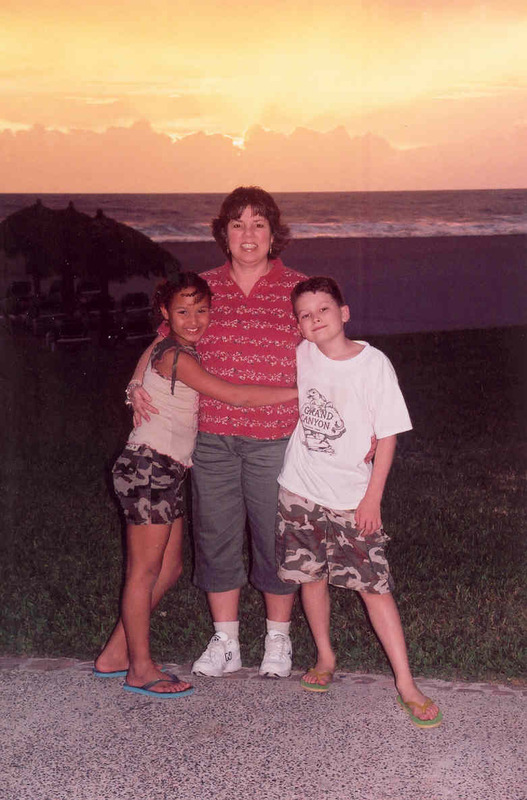 Elizabeth and the kids at the beach. 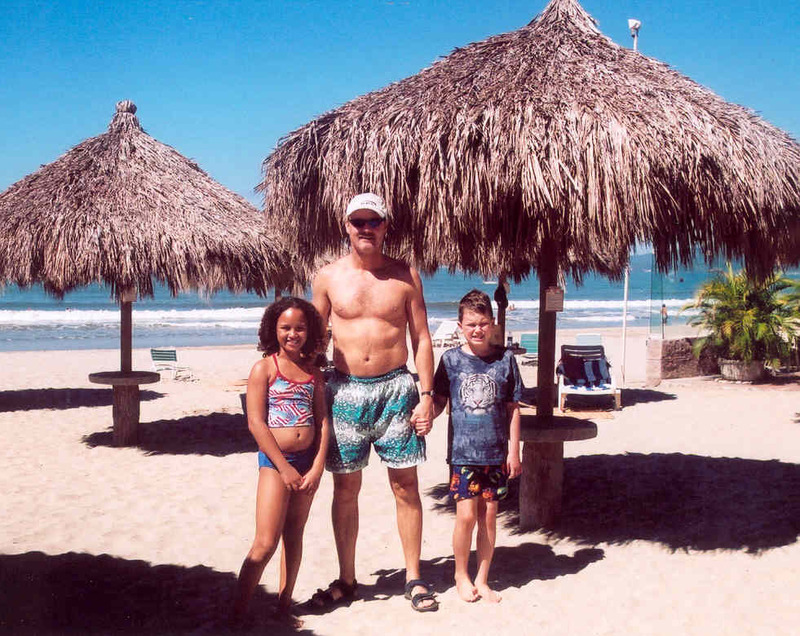 Tom and the kids at the beach. Toms final replacement set of keycards. 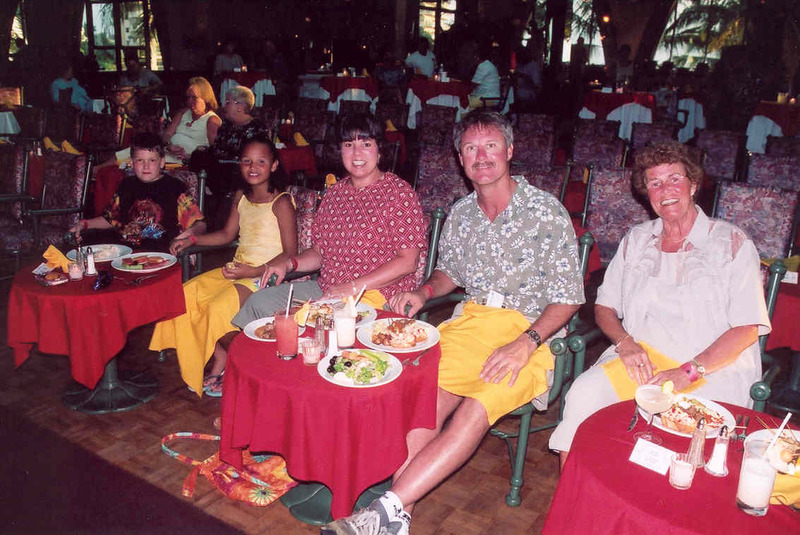 One night we had a buffet dinner at a Flamenco Concert in one of the resort ballrooms. The food was excellent. The guitar players were pretty good... if you like that sort of music. We all had a good case of sunburn by the end of the week.